This pattern book has six more mini clock patterns. Each clock requires a 1 7/16" mini clock insert. I have several readers in Australia. You may have seen on the news that much of the country has been savaged by incredibly high temps and out of control fires. The temperatures have climbed to over 110 Fahrenheit in some areas. I just want to wish all of you guys the best of luck. Sounds like there might be a little break in the temps soon. 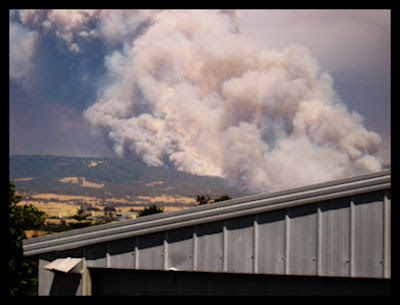 This picture from Bob shows one of the wild fires. This is a view from his property. Stay safe bob.